To read the winning entries from our eighth competition just click on the links below and scroll down to view judges’ comments. 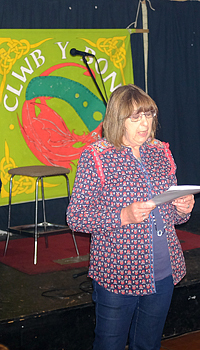 A special prize giving evening was held at Clwb Y Bont, Pontypridd on 23rd July 2014. Several of the winners travelled from many miles away to receive their prizes and read out their work, and we’d like to say how grateful we are that so many made the effort to contribute to a great night. 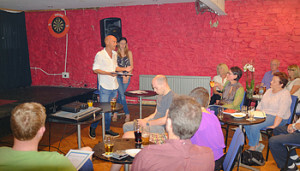 Results were also announced on our web site, Facebook Group and Twitter pages. We also informed Literature Wales, Pontypridd Observer and associated district newspapers, SW Echo, the Western Mail, BBC Wales and RCTCBC as well as many organisations on our mailing list. Thanks to Eloise Williams for judging this years competition, and thanks also to all those who entered and look forward to reading your work next year. A very high standard this year, 2014. Overall the quality was very good and there were a large number of poems. The three winning poems were all exceptional and an excellent reminder of the true value of the poetic form and it’s rightful place in our society. I have to confess, I’d never really liked poems about paintings, and especially “famous” pieces of art; often feeling they seldom add any fresh perspectives to the original work and sometimes even have a somewhat parasitic quality. Edward Munch’s, ‘The Scream’ is one of the most famous, and instantly recognisable pieces of art in existence. It’s also iconic, in that it has often considered to be the one painting that captures all the existential angst of modern man. It is also one of my own favourite paintings. And so, here I am judging this years competition and in my hands is “a poem about ‘The Scream'” and despite all of my misgivings, I am completely won over! Yes, this is a poem about ‘The Scream’, and it’s as good an appraisal of the painting and you are ever likely to get. And, as it’s also written with all the freedom the medium of poetry affords it is able to go far beyond the sterile analytical prose of the art critic: “The flay of his face held between / splayed fingers. Eyes wide, mouth open, / his head a burnished planet”. Yes, it is all of that, and so much more. The writer cleverly weaving questions to Munch (questions we might all like answered) from an imaginary interviewer. Each question probing further and further into the dark recesses of his mind: “Tell me, Mr. Munch, on a scale of 1 to 10 / how bad is the pain?”. Each one giving us fresh glimpses into the inner turmoil that inspired the painting; that existential crisis Munch experienced as the Norwegian mountains and fjords were transformed into a landscape of the soul by what he described as “the enormous infinite scream of nature”. The poem is lyrical, and filled with striking, original images: “How the soul cracks / like a shattered egg before the shriek of colour.” It also cleverly mirrors Munch’s chosen painting style by using colours to express emotional states: “How the scream rises from the mouth of the earth / red as blood, as tongues of fire”. Yes, in all so many ways, this is a poem about the Scream, and yet it stands alone, by itself, as an excellent and highly original work of art. A very worth winner of this year’s competition. Haiku like. Lyrical. Elliptical, yet flowing like the oceans which it depicts. Each line, each image “spin your aria of flight through the sound of nowhere”, building and lifting until the reader is soaring like the very bird which is the main focus of the poem, “fleet the deep-blue ocean with white skimmering wingtips”. Being a keen ornithologist, again, when its subject matter is such a magical and mythical bird as the albatross it would need to be a very, very, good poem to captivate me. And then, also, there is the Coleridge issue. The popularity of his poem being such that, ironically, it has often been the proverbial albatross around the neck for any writer brave enough to attempt writing a poem about this subject. And yet, it succeeds so magnificently and the reader is completely “won over”: “surrendering to lonely beaches, the bleak grey-black southern shores”. This poem ends with lines of magical beauty that have a simple, but moving, zen like quality sometimes found in the best of the Japanese short-form but rare in Western poetry: “so to make the water and sky know you / – the whales and ships sing / bright into the distant light”. As is often the case, less is more. Another excellent poem, and a worthy runner-up. A truly remarkable poem. The writer seamlessly merging past wars, past glories, past failures, with more recent military campaigns. They say, “history never repeats itself”…but when it comes to wars and bloodshed, and all the jingoism (and of course just a dash of “our god is better than your god” religion) that goes with it, of course it does. “Flags raised, caps thrown / in the air of Victory – / or dreams, of graphite, / oil, diamonds”. This poem successfully reminds us of the pain, loss, and, above all, futility of all wars; yesterday, today or tomorrow: “Smother the din of bells / in good Thames mud – / damn the memories / of a choir of widows”. We, the people, all of us, on both or all sides, are the ones that really suffer: “over rows of dead boys / from Copperfield Street – / traded-in for the beam / of a holy heart on stained / glass…”. While the war makers: the kings and queens, the political and religious leaders, the money makers…sit back and watch: “Halig, the bald witch / who never gives a tea-time fig / for rook-song jigs”. 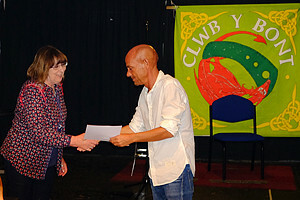 Another very accomplished poem which rightfully takes its place among the top prize winners.